The acitvity of the Pulsed Laser Deposition research group is focused on the development of new nanostructured materials and the characterization of their physical properties. The group has an established experience in growing, by laser assisted photodeposition, thin films and heterostructures with different functional properties: high critical temperature superconductors, magnetic materials, piezoelectric materials and materials for applications in the "fuel cells" field. Among the transition metal oxides we work on magnetic oxides such as perovskite manganites. Perovskite manganites, especially La1-xSrxMnO3 (LSMO) are particularly important because of their ferromagnetic metallic behavior with relatively high Curie temperature and large polarization. Controlling the magnetic interaction at interfaces with manganites will allow the development of new devices such as those based on tunneling magnetoresistance or exchange based effects. From this respect the knowledge of the microscopic orbital and spin states is fundamental to tune the functional properties. We reported the first evidence of stabilization of d(x2-y2) and d(3z2-r2) orbitals depending of the sign of the strain, if tensile or compressive, in LSMO thin films on SrTiO3 and LaAlO3 substrates, respectively. Furher investigations demonstrated that the broken symmetry at the interfaces stabilizes the d(3z2-r2) whatever the mismatch between manganite film and substrate. High temperature superconducting cuprates consist of two structural blocks, having different functional properties, stacked along the c-axis. The first block, sometimes called “infinite layer” (IL) block, consists of CuO2 planes separated by a bare cation plane. The second block, which is charge unbalanced by cation substitution or oxygen nonstoichiometry, is thought to act as a charge reservoir (CR) for the IL block. In this simple structural model, charge transfer from the CR block is thought to give rise to superconductivity in the IL block. Standard high temperature superconductors are often considered as “natural superlattices” made of CR and IL blocks. In this sense some sort of “interaction at the interfaces” can be foreseen for these compounds. We have disassembled the superconductor in the constituent blocks and grown artificial superconducting superlattices obtained by stacking in a sequence the the CR and the IL blocks. Superconductivity was obtained in heterostructures and superlattices consisting of an insulating and a metallic cuprate, namely CaCuO2(CCO) and BaCuO2 (BCO). CCO has the IL structure where the CuO2 planes are separated by bare Ca atoms. The BCO, which has a more complex structure including extra apical oxygen ions, behaves as the CR block. The highest critical temperature was about 80 K in CCO/BCO superlattices with three CuO2 planes in the CCO block. More recently, superconductivity was found in CaCuO2/SrTiO3 superlattices grown under strongly oxidizing conditions with a maximum critical temperature of about 40K. 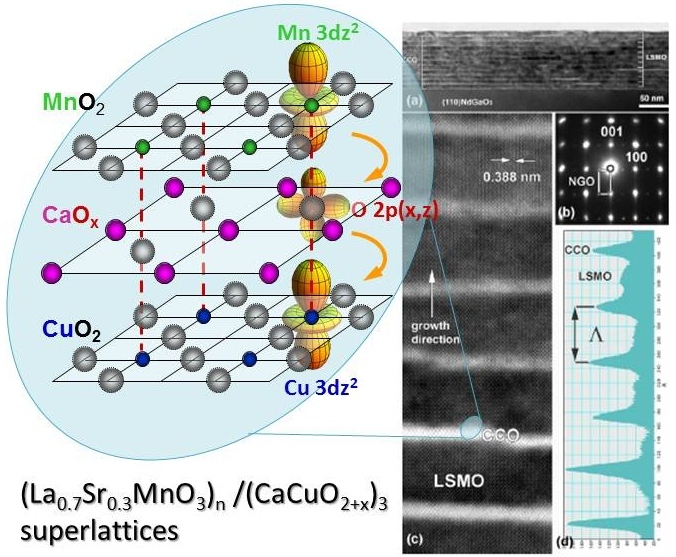 The role of the extra oxygen at the interfaces, which thus act as charge reservoir for the CCO block, was envisaged by the presence of Cu 3d(eg) holes with out-of-plane orbital symmetry. Similarly, interfacial Cu 3d(3z2-r2) orbitals of CCO were also observed in LSMO/CCO superlattices. The "Solid Oxide Fuel Cells" (SOFC) are devices capable of directly converting the chemical energy of a fuel into electrical energy. The fuel is generally constituted by a gas mixture containing hydrogen, thus electricity and water is produced as a result of the operation of the SOFC. The interest in this type of devices increased enormously in the last years for its numerous applications in the field of mobile devices such as laptops and mobile phones. The main advantages offered by the SOFC compared to the Li-ion batteries are the absence of charge-discharge cycles and an higher energy density. 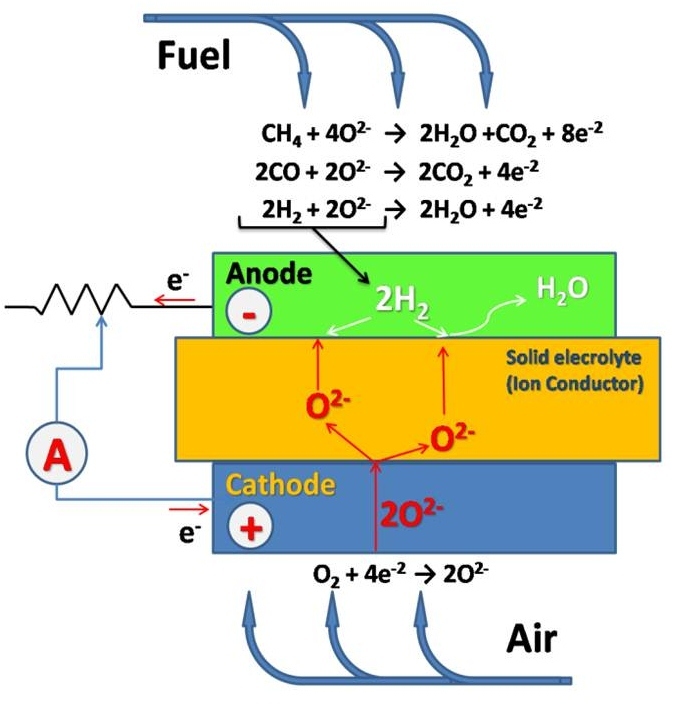 One of the characteristics that limits the application of fuel cells in portable devices is the high working temperatures of the fuel cells, generally between 800 and 1000° C. Such high working temperatures are necessary in order to obtain high values ​​of conductivity, that can be proton or ionic depending on the electrolyte material. The growth and the study of new materials to be used as ionic or proton conductors is mainly devoted to increase the conductivity at low and medium temperatures, to allow the operation of SOFC at temperatures between 500 and 800° C. The activity of the Pulsed Laser Deposition research group is addressed to both ionic and proton electrolytes. In the field of proton electrolytes the group obtained important results on yttrium doped barium zirconate (BZY). High quality films of BZY, without grain boundaries, were obtained. The films showed the highest ever obtained proton conductivity, much larger than the conductivity of the best ionic conductors. Relevant results were also obtained in the field of ionic conductors. In particular, the group investigated the samarium doped cerium oxide (SDC). SDC has a high ionic conductivity and is one of the best candidates to be used as an electrolyte in SOFC at intermediate temperature, but showing a high instability and degradation. SDC films were grown on MgO substrate. The stability of the films was significantly improved by using a buffer layer of SrTiO3 (STO), which improved the crystallographic properties of SDC. The absence of grain boundaries in the SDC/ STO/MgO heterostructure enhanced the stability to the oxidation-reduction cyclic processes in atmosphere with hydrogen. We develop the method of investigation of intrinsic properties of superconductors by means of detailed analysis of their fluctuation magneto-conductivity, tunneling characteristics, Nernst coefficient and other physical characteristics throughout the whole phase diagram. We use our many years experience in diagrammatic methods application to theory of metals in order to study high frequency electric transport, thermoelectricity and thermomagnetic phenomena, including Shubnikov- de Haas oscillations, in graphene and graphene-like systems. Nernst Effect and thermal transport in different novel systems. 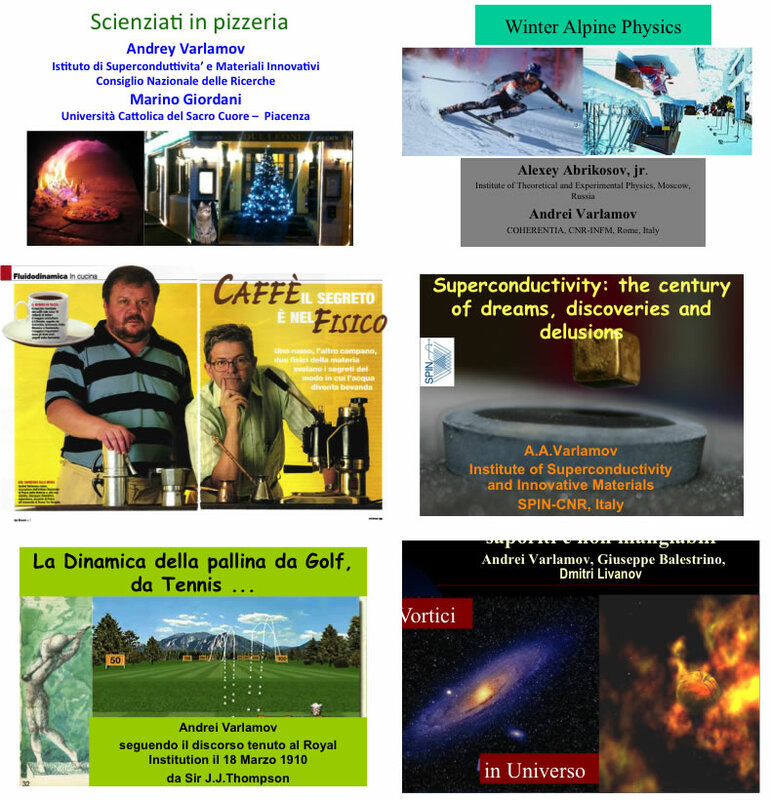 We have been studied manifestation of the giant Nernst effect in such novel systems as high temperature and low dimensional traditional superconductors in fluctuation regime, graphite/graphene, electrolytes. Starting from the traditional methods of quantum field theory we elaborated the new, much more evident, way of description of thermoelectric and thermomagnetic phenomena, unifying the thermodynamic approach with the kinetic description. We have been promoted the recent achievements of science and its manifestation in the surrounding world in form of public lectures, popular science articles, TV transmissions, organization of colleges for teachers, different kind of Festivals of Science.